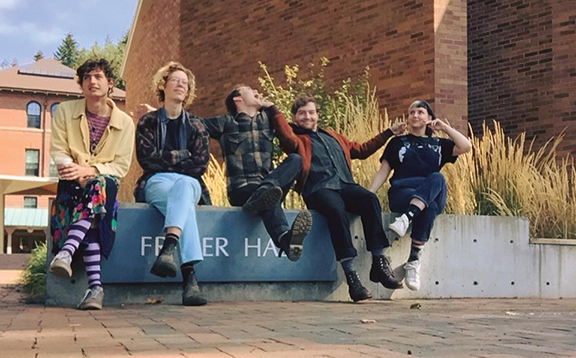 Using hooked harmonies and engaging song structures, Bellingham’s Foxing Gloves are writing some of the most interesting songs in the music scene these days. Now if they can just find a drummer. The seeds of Foxing Gloves date back to high school in the Bremerton/Silverdale area when guitarist and principal songwriter, Eli Jackson, had a friend reach out via Facebook and suggest he meet Dylan Hall. Jackson saw a picture where he was playing a guitar and instantly thought he might have a kindred spirit in the musical desert that is his hometown, at least for pop music. “There were a lot of screamo dudes, which is fine, just not what we were doing,” Eli said. Foxing Gloves began as a “folksy duo,” according to Eli, with Darla Rae Balbarona becoming a member of the band. Over the next few years, they played, would break up, some members would play under a different name, they played long distance with Dylan living in Bellingham… all the while the context of Foxing Gloves would continue to hold these connections together and writing as they could. Late last year, Dylan, Eli and Darla decided to move to Bellingham to be with drummer Joey Schmitt with the intention of making Foxing Gloves a legitimate band with everyone in the same city. History recorded, the band has been moving forward with their new songs, playing shows, and continue to go through line up changes. Darla moved on from the band; Meg Hall (Dylan’s sister) and Augie Balew joined. Recently, Joey (who also plays in Razzleberry) announced he’d be leaving the band, so they’re now on the lookout for a new drummer. Musically, Eli, pulls his influences from an array of acts – from Elliot Smith to Simon and Garfunkel to They Might Be Giants. “…the songs on A Ghost, you can hear more Nirvana, Beck, Beatles and Ben Folds.” Those influences, while prominent in shaping the Foxing Gloves’ sound, never take over, instead acting as a guardrail throughout the songs, allowing the harmonies and hooks to flow through interesting blueprints. Line up changes and needs be damned, Foxing Gloves are creating pop music to be heard in Bellingham and hopefully beyond. Follow their social media for updates.